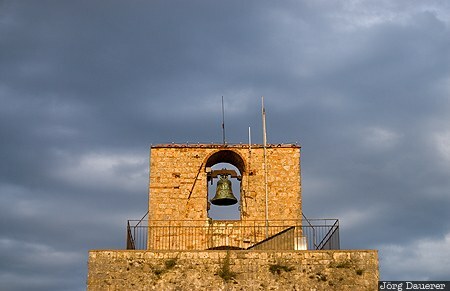 A bell on top of a tower of the Cassero Senese (Sienese Fortress) of Massa Marittima illuminated by low evening light in front dark clouds. Massa Marittima is in the province Grosseto in the southern part of Tuscany, Italy. This photo was taken in the evening of a cloudy day in October of 2009. This photo was taken with a digital camera.